5Department of Neuropathology, Charité—Universitätsmedizin Berlin, Berlin, Germany. Background Congenital muscular dystrophies (CMD) with hypoglycosylation of α-dystroglycan are clinically and genetically heterogeneous disorders that are often associated with brain malformations and eye defects. Presently, 16 proteins are known whose dysfunction impedes glycosylation of α-dystroglycan and leads to secondary dystroglycanopathy. Objective To identify the cause of CMD with secondary merosin deficiency, hypomyelination and intellectual disability in two siblings from a consanguineous family. Methods Autozygosity mapping followed by whole exome sequencing and immunochemistry were used to discover and verify a new genetic defect in two siblings with CMD. Results We identified a homozygous missense mutation (c.325C>T, p.Q109*) in protein O-mannosyl kinase (POMK) that encodes a glycosylation-specific kinase (SGK196) required for function of the dystroglycan complex. The protein was absent from skeletal muscle and skin fibroblasts of the patients. In patient muscle, β-dystroglycan was normally expressed at the sarcolemma, while α-dystroglycan failed to do so. Further, we detected co-localisation of POMK with desmin at the costameres in healthy muscle, and a substantial loss of desmin from the patient muscle. Conclusions Homozygous truncating mutations in POMK lead to CMD with secondary merosin deficiency, hypomyelination and intellectual disability. Loss of desmin suggests that failure of proper α-dystroglycan glycosylation impedes the binding to extracellular matrix proteins and also affects the cytoskeleton. Congenital muscular dystrophies (CMD) are clinically and genetically heterogeneous neuromuscular disorders that are characterised by the onset of muscle weakness at birth or during early infancy and by dystrophic changes in the muscle. Dystroglycanopathies are a major subgroup among the CMD and are often associated with brain and eye defects. Dystroglycan is encoded by the DAG1 gene, is post-translationally glycosylated and cleaved into α- and β-subunits. α-Dystroglycan, a peripheral membrane protein, serves as a receptor for different extracellular matrix components, such as laminin, agrin, perlecan, neurexin and pikachurin.1 ,2 It is non-covalently bound to the β-dystroglycan subunit, which spans the cell membrane and binds to the dystrophin complex. Thus, dystroglycan forms a link between the extracellular matrix and the cytoskeleton, playing a crucial role in force transmission and signal transduction. Hitherto, mutations in 16 proteins have been discovered that are all involved in the glycosylation of α-dystroglycan and whose dysfunction causes congenital muscular dystrophy. During preparation of this manuscript, POMK (protein O-mannosyl kinase; syn. SGK196) was found to phosphorylate O-mannose at its 6-position, but only if the GalNAc-β1,4-GlcNAc-terminus had already been linked to the 4-position of O-mannose, serving as substrate recognition motif of POMK.7 This fact clarifies, why mutations in GTDC2 and B3GALNT2 cause dystroglycanopathies, even if their products do not directly interact with extracellular matrix ligands. Further, a single patient with Walker–Warburg syndrome (WWS) was reported to carry a compound heterozygous mutation in POMK.28 The disease is meanwhile named in the OMIM database as ‘Muscular dystrophy-dystroglycanopathy type A 12’ (MDDGA12, #615249). Here we searched for the causative mutation and found a homozygous missense mutation in POMK in a consanguineous family from Lebanon whose children were affected with a connatal myopathy associated with merosin deficiency, hypomyelination and intellectual disability, thus expanding the clinical phenotype of MDDGA12. The study was approved by the local ethical review board of the Charité (EA1/228/08). The parents provided written informed consent for all aspects of the study according to the Declaration of Helsinki. The family originated from Lebanon. The parents are first-degree cousins, and two of five children are affected with a connatal muscle disease (figure 1A). Clinical and morphological images of the patients. (A) Pedigree and genotype of the family members of the consanguineous family from Lebanon with two affected children. (B and C) T2-weighted cranial MRI of the patients with prominent areas of hypomyelination of the cerebral white matter in the periventricular areas (open arrows). (D) Immunohistochemistry of a patient muscle versus an age-matched control. The sarcolemmal expression of ‘merosin’ is severely reduced in the patient. This is confirmed by reduced expression of the 80 kDa fragment of laminin α2, while expression of the 300 kDa fragment is less affected. We further see lack of sarcolemmal α-dystroglycan expression, while β-dystroglycan is regularly expressed (original magnification ×400). The now 21-year-old woman was born after an uncomplicated pregnancy. Head circumference was normal at birth but by 2 years of age she was microcephalic. Muscular hypotonia caused feeding problems due to weakness in sucking, poor head control and motor developmental delay. Creatine phosphokinase (CPK) levels were elevated (1238 IU/L, normal <180 IU/L) and a muscle biopsy at 9 months of age revealed a myopathic pattern with normal dystrophin expression. Re-biopsy at 4 years demonstrated a severe reduction of the 80 kDa fragment of laminin α2, whereas the 300 kDa fragment was only partially and incompletely expressed on the sarcolemma of myofibers. Also a further ‘merosin’ stain confirmed severely reduced sarcolemmal staining. Neurography, EEG and ECG and echocardiography were normal. Cranial MRI revealed symmetric cerebral white matter changes at 15 months of age (figure 1B). Her eyes appeared strikingly large (corneal diameter=11.5 mm), but did not reach the criteria for megalocornea (≥13 mm). Her motor and mental development were severely retarded. At 2 years of age, a moderate sensorineural hearing loss was treated with hearing aid devices, which, however, did not improve her speech development and she was only able to speak 3–4 word sentences at 5 years of age (normal 2.0–2.5 years). She started walking independently at 2.5 years of age (normal 11–15 months) with persistent difficulties in climbing stairs and running. Muscle weakness progressed and by the age of 17 years she was completely wheelchair dependent. Presently, she is not able to stand, eat or drink without support. The younger brother of patient 403 is now 15 years old. He was hypotonic from birth with proximal weakness, little antigravity movement and hyporeflexia. CPK levels were raised (1810 IU/L) and cranial MRI at the age of 5 months and at 2.4 years also revealed hypomyelination (figure 1C). Just as his sister, he too has large, but structurally normal eyes, with reduced visual acuity. Brainstem-evoked potentials revealed a moderate hearing impairment. Psychomotor development was severely delayed. He was never able to sit unsupported, and by the age of 2 years he could only roll onto his side. At 2 years, muscle atrophy resulted in flexion contractures of his hips and knees. Muscle biopsy at the same time revealed a myopathic picture and merosin deficiency (figure 1D) as seen in his sister, and he was provided with an electric wheelchair. At 10 years of age, a rapidly progressive scoliosis was treated by spondylodesis. Pulmonary function was pathologic with a vital capacity decreasing from 50% (9 years) to 36% (14 years). Polysomnography revealed a secondary hypoventilation syndrome. DNA was extracted from peripheral blood leukocytes according to standard procedures. Autozygosity mapping. DNA samples of two affected (403, 405) and two unaffected siblings (402, 404) were subjected to autozygosity mapping using the Affymetrix GeneChip Human Mapping 6.0 single nucleotide polymorphism (SNP) array, as previously described.29 With the help of the HomozygosityMapper2012 software30 (http://www.homozygositymapper.org), we delineated the regions that were autozygous only in the affected individuals. Exonic sequences were enriched from the DNA sample of patient 403 using the Agilent SureSelect V4 Human All Exon 51 Mb Kit (Agilent Technologies). Sequencing was performed on a HiSeq2000 machine (Illumina), which produced 76 million 100 bp paired-end reads. The combined paired-end FASTQ files were aligned to the human GRCh37.p11 (hg19 /Ensembl 72) genomic sequence using the BWA-MEM V.0.7.1 aligner.31 The raw alignments were fine adjusted and called for deviations from the human reference sequence (GRCh37.p11) in all exonic ±50 bp flanking regions using the Genome Analysis Toolkit (GATK V.2.7-2) software package.32 ,33 The resulting variant (VCF) file comprised 96 471 variants and was sent to the MutationTaster Query Engine34 software (http://www.mutationtaster.org/StartQueryEngine.html) for assessment of all variants for potential pathogenicity. The filtering options of MutationTaster were set to ‘autozygous region’, ‘homozygosity’, ‘removal of all variants occurring >4x in the 1000 genomes project in homozygous state’. Co-segregation of the POMK/SGK196 mutation and the phenotype was validated in the entire family by PCR and subsequent bidirectional Sanger sequencing using the BigDye Terminator protocol on an Applied Biosystems (ABI) capillary sequencer (Life Technologies) and the oligonucleotide primers (FOR) 5-GCA ACT CTA CGA TGG GGT CT-3 (REV) 5-CTG CCA CGT GTT CAC ATT TT-3. Protein was extracted from fibroblasts and muscle of patients and controls after homogenisation in lysis buffer with a proteinase inhibitor cocktail (Complete, Roche-Diagnostics), separated by denaturating sodium dodecyl sulfate polyacrylamide gel electrophoresis (SDS-PAGE) with the Laemmli system and blotted on nitrocellulose membranes by the semidry method (Biometra) as previously described.35 The blots were probed with the mouse monoclonal FLJ23356 antibody (clone 6F10, immunogen: amino acids 251–351 of NP_115613, Novus Biologicals H00084197-M0500, dilution 1:500) in 5% milk powder overnight followed by the secondary goat-antimouse IgG peroxidase conjugated antibody (clone DC02L, Calbiochem, dilution: 1:2000). Bands were visualised by chemiluminescence. Subsequently, the blot was stripped and re-probed with a second mouse monoclonal anti-FLJ23356 antibody (clone s-23, immunogen: full-length recombinant protein. Santa Cruz sc-100433, dilution 1:200). After a second stripping, the same blot was labelled with a monoclonal rabbit antidesmin antibody (cone Y66, immunogen: C-terminus of desmin, Epitomics #1466-1, dilution 1:250). The density of the Glyceraldehyde 3-phosphate dehydrogenase (GAPDH) bands was used for loading control. Patient and control fibroblasts were grown on cover slips and fixed in 4% paraformaldehyde. After permeabilisation, cells were incubated first with the Novus FLJ23356 antibody (1:100 for 3 h) in 10% normal goat serum at room temperature and then with ALEXA568 antimouse-IgG 1:200 for 45 min in 10% normal goat serum at room temperature and counterstained with 4′,6-diamidino-2-phenylindole (DAPI). Images were recorded with an inverted fluorescent microscope (Leica DMI3000). For immunohistochemistry of muscle (figure 1D), 7 μm cryosections were stained with primary antibodies directed against: merosin (clone Mer3/22B2, Novocastra), laminin α2 80 kDa (clone 5H2, Millipore), laminin α2 300 kDa (clone 4H8-2, Alexis Biochemicals), α-dystroglycan (clone IIH6C4, Millipore), and β-dystroglycan (clone DAG1/8D5, Novocastra). Immunohistochemistry was performed using the iVIEW-Ventana ABC Kit (Ventana), with appropriate biotinylated secondary antibodies and diaminobenzidine visualisation of the peroxidase reaction product on a Benchmark XT immunostainer (Ventana). For SGK196/desmin immunofluorescent costaining (figure 3D), 10 µm muscle cryosections were first incubated with the Novus FLJ23356-mAB (dilution 1:50) and subsequently with the rabbit antidesmin-mAB (Cell Signaling #4024, dilution 1:100). Signals were visualised with secondary ALEXA568 antimouse-IgG and ALEXA488 antirabbit-IgG antibodies, and the nuclei were counterstained with DAPI. Having delineated the candidate region on chromosome 8 by autozygosity mapping (figure 2A), whole exome sequencing was performed on patient 403 (figure 1A). Alignment of all paired-end fragments yielded an average coverage of n=101 for all exons represented by the Agilent SureSelect V4 Human All Exon 51 Mb Kit (92.8% of the exons were covered at least 3x, 87.4% >10x, 81.6% >20x). Starting from 96 471 heterozygous and homozygous variants for the whole exome that deviated from the reference sequence, MutationTaster returned 340 potentially ‘disease-causing’ homozygous variants (0.35%), 52 of which led to an exchange of the amino acid sequence (0.05%). In the 38 Mbp autozygous region we found 13 predicted ‘disease causing’ homozygous variants, four of which led to an exchange of the amino acid sequence (PRKDC: p.G3148D (rs8178208), SLCO3A1: p.I560 V (rs141187463), ANKRD5: p.R742Q (rs6087119), SGK196: p.Q109* (not reported in dbSNP)). Molecular findings. (A) Results of autozygosity mapping with the HomozygosityMapper software, genomic structure and the position of the truncating mutation. Secondary protein structure with N-terminal transmembrane domain (TMD) and a C-terminal kinase domain. (B) Results of the Sanger sequencing in the family. (C) Western blot of cultured control and patient fibroblasts reveals complete absence of the protein O-mannosyl kinase (POMK) specific band. (D) In the western blot of muscle, the POMK specific band runs at a higher molecular weight at around 100 kDa and was absent in the patient muscle after staining with two different antibodies. The desmin band was strongly reduced in the protein extract of the patient muscle. Immunohistology of protein O-mannosyl kinase POMK/SGK196. (A) Staining of cultured fibroblasts with an anti-SGK196 antibody demonstrates a filamentous distribution of POMK in controls, which was absent in both patient fibroblast lines. (B) Immunostaining of control muscle revealed sarcolemmal staining of POMK, whereas in the patient muscle, we only found autofluorescent crystalline structures. (C) The confocal image of an axial cross-section through the myofibers verifies the dotted sarcolemmal staining of POMK, which envelopes the myonucleus. (D) Co-localisation of POMK/SGK196 and desmin at the costamere structure of the myofiber. PRKDC is not known as a human disease gene, however, it carries the causative mutation for severe combined immunodeficiency in mice.36 Our patients, however, did not show any signs of immunodeficiency. Moreover, three heterozygote carriers of the p.I560 V variant were found in the healthy population of the 1000 genome project. SLCO3A1 is not expressed in muscle, but mainly in brain and testis participating in the transport of prostaglandins, thyroxin, cyclic oligopeptides and vasopressin.37 In the 1000 genome project the p.I560 V variant was found once in heterozygous state. A polymorphism in this gene is discussed to contribute to nicotine dependence.38 We thus cannot exclude with certainty that at least part of the cerebral phenotype might be attributed to this homozygous variant. ANKRD5, a gene of unknown function, was ruled out as a potential disease gene, because the p.R742Q variant was found 134x in heterozygous and 3x in homozygous state in the 1000 genome project. The remaining variant was a cytosine-to-thymine exchange at Chr8:42 977 292 (hg19) in POMK/SGK196 (c.325C>T) that introduced a premature stop codon in the last exon (exon 5). It was neither listed in the 1000 genome nor the 5000 exome project or in dbSNP. Additionally, the variant was absent from our local whole exome database (122 exomes). The genotype-phenotype segregation in the family was verified by Sanger sequencing (figure 2B). For the investigation on the protein level, we had to our disposal cultured skin fibroblasts of both patients and a muscle biopsy of patient 405. Full-length wild-type POMK has a predicted molecular weight (MW) of 40.15 kDa. The mutation would truncate the protein by 69% to a predicted MW of 12.40 kDa. Examination of cultured skin fibroblasts (patients 403, 405 and controls) by staining with a specific SGK196 (FLJ23356) antibody revealed a signal along intracellular fibres in a distribution reminiscent of tubulin staining in controls, which was entirely absent from the patient fibroblasts (figure 3A). The complete absence of the SGK196 protein band at ≈50 kDa from the patient fibroblasts was further verified on western blot in comparison with three control lines (figure 2C). In skeletal muscle of patient 405, we verified the absence of full-length SGK196 on western blot with two different antibodies (figure 2D). Immunostaining of cryosections of normal control muscle revealed the presence of SGK196 in sarcolemmal costameric structures and around the myonuclei (figure 3B,C). In the patient muscle, the SGK196 signal was absent and we only discovered autofluorescent crystalloid precipitates (figure 3B, right panel). The immune signal of SGK196 was found in a similar localisation as desmin at the costameres as well as at around the myonuclei (figure 3C). Since it had been suggested that desmin intermediate filaments are anchored via plectin to the dystroglycan complex at the sarcolemma (via β-dystroglycan),39 we additionally did a co-immune staining of normal longitudinal muscle sections with SGK196 and desmin antibodies. We were able to demonstrate largely co-localisation between SGK196 and desmin, whereas the desmin band was considerably reduced in the western blot of the patient muscle in comparison with two normal controls (figure 2D). We report on two patients with a deficiency of POMK protein caused by a premature stop codon in exon 5 of the POMK/SGK196 gene. Immunostaining and western blot with two different monoclonal antibodies verified the absence of POMK from a muscle biopsy sample of one, and in fibroblasts of both affected individuals. The clinical phenotype of the patients segregated with homozygosity for the mutation. POMK comprises three non-coding and two coding exons that encode an N-terminal transmembrane domain (figure 2A) and an extracellular kinase-like domain. The POMK gene is conserved in mammals (percent of identity: Pan troglodytes 99%, Bos taurus 77%, Mus musculus 81%), birds (Gallus gallus 65%), fish (Danio rerio 55%), and amphibiae (Xenopus laevis 63%). A recent report describes the clinical and histological phenotype of a 4930444A02Rik (SGK196) gene-trap mouse that had an insertion of the gene-trap vector in intron 1 and was produced in a high-throughput facility.40 Clinically, the mouse showed a hydrocephalus with a dome shaped head, impaired motor strength, tremor, impaired learning and memory, and decreased sensitivity to acute and tonic pain. Besides the hydrocephalus, histological investigation revealed heterotopias hinting towards a disorder of neuronal migration. Failure of proper neuronal migration was predominantly seen in the cerebellum, where external granular neurons were found on the surface of the cerebellar hemispheres and Purkinje cells inside the molecular layer. These changes were even present in one animal that did not have hydrocephalus.40 In our patients, we did not see hydrocephalus (figure 1B,C), but predominantly a disorder of myelination, which would be difficult to see in young mice if not specifically screened for. In contrast with the gene-trap mice, the patients did not have a cerebellar atrophy, while it would be difficult to ascertain functional cerebellar symptoms in the presence of profound muscle weakness. Macroscopic heterotopias were not seen on cranial MRI, nor did the patients suffer from epilepsy, which would be expected in the presence of widespread cortical heterotopias, especially in the hippocampal areas. During preparation of this manuscript, a single patient with WWS and a compound heterozygous mutation in POMK/SGK196 (p.L137R/p.Q258R) was described.28 Besides being diagnosed as congenital muscle dystrophy with high CPK levels, the girl suffered from a complex disorder of brain development including aquaeductal stenosis, hydrocephalus, agyria, as well as cerebellar and brainstem hypoplasia and Arnold-Chiari malformation, and died by the age of 3 years. This stands in contrast with the predominant hypomyelination and mental retardation seen in our patient, whose phenotype was much milder despite the absence of full-length POMK protein. The ocular phenotype also differs between the two case reports with our patients having large, but structurally normal eyes with reduced visual acuity, while the patient of Jae et al had microphthalmia, a persistent hyperplastic primary vitreous body, myopia and a cataract. Since our patients have become much older, it shows that their muscle dystrophy is progressive leading to orthopaedic problems (scoliosis and flexion contractures), wheelchair dependency and hypoventilation. Recently POMK/SGK196 was found to specifically phosphorylate O-mannose at its 6-position but not before the mannose had been modified by the GalNAc-β1,4-GlcNAc-terminus on its 4-position.7 The resulting phosphodiester-linked branch structure seems to be the relevant glycan-structure of α-dystroglycan to bind extracellular matrix ligands. In our patient, failure of proper α-dystroglycan glycosylation led to the phenotype of a severe congenital muscle dystrophy with secondary severe reduction of merosin/α2-laminin staining on the sarcolemma of muscle fibres. This is in contrast with the findings in the muscle biopsy of the patient from Jae et al at the age of 18 months where no abnormality of merosin immunohistochemistry was reported. As expected for a glycosylation defect, staining with anti-α-dystroglycan produced no sarcolemmal immunoreactivity, while β-dystroglycan was normally expressed on the sarcolemma of the patient's muscle. However, the ensuing functional deficit of α-dystroglycan affected the interaction with the extracellular matrix, and also led to the virtual disappearance of desmin on the western blot (figure 2D). Desmin is a muscle-specific, type III intermediate filament of 52 kDa, which is found in skeletal muscle around the Z-lines and the costameres where it connects the sarcomere to the subsarcolemmal cytoskeleton. The experimentally proven interactions between desmin and plectin41 and, in turn, between plectin and β-dystroglycan,39 make it probable that a dysfunctional α-dystroglycan might exert an indirect influence on the assembly of intermediate filaments and, thus, on the stability and mechanical properties of the cytoskeleton during contraction. One line of evidence from animal experiments hints towards sarcolemma instability during stretch as the pathogenic principle. In cardiomyocytes of Large knockout mice (Largemyd), the deficiency of α-dystroglycan glycosylation not so much impaired its adhesion to laminin but more the sarcolemmal integrity of the myocytes during cyclical cell stretching with influx of membrane-impermeant dye.42 On the other hand, morpholino-mediated knockdown of desmin by ≈50% in zebrafish lowered tension of the myofibrils but made them more resistant against acute eccentric stretch-induced injury.43 It is therefore difficult to fathom whether the secondary desmin deficiency in our patient would aggravate or ameliorate their muscle dystrophy. It needs to be investigated in the future, which part of the symptoms reported here are caused by failure of the dystroglycan complex to bind and signal to the extracellular matrix, and which are due to the myofibrillar derangement of the cytoskeleton. Further, it would be worthwhile to investigate how desmin and the cytoskeleton are affected by other disorders of dystroglycan glycosylation. In summary, we detected a homozygous truncating mutation in POMK in two siblings from a consanguineous family with congenital muscular dystrophy and central hypomyelination that led to the absence of POMK from the muscle cell and a secondary loss of merosin and desmin. The authors would like to thank the patients and their parents for participation in the study. The excellent technical assistance of Angelika Zwirner is much appreciated.
. Pikachurin interaction with dystroglycan is diminished by defective O-mannosyl glycosylation in congenital muscular dystrophy models and rescued by LARGE overexpression. Neurosci Lett 2011;489:10–15.
. The O-mannosylation pathway: Glycosyltransferases and proteins implicated in congenital muscular dystrophy. J Biol Chem 2013;288:6930–5.
. A dystroglycan mutation associated with limb-girdle muscular dystrophy. N Engl J Med 2011;364:939–46.
. Homozygous dystroglycan mutation associated with a novel muscle–eye–brain disease-like phenotype with multicystic leucodystrophy. Neurogenetics 2013;14:205–13.
. Structures of sialylated O-linked oligosaccharides of bovine peripheral nerve α-dystroglycan. The role of a novel O-mannosy-type oligosaccharide in the binding of α-dystroglycan with laminin. J Biol Chem 1997;272:2156–62.
. SGK196 is a glycosylation-specific O-mannose kinase required for dystroglycan function. Science 2013;341:896–9.
. Dystroglycan function requires xylosyl- and glucuronyltransferase activities of LARGE. Science 2012;335:93–6.
. Cloning, expression and characterization of the pig liver GDP-mannose pyrophosphorylase. Eur J Biochem 2000;267:6866–74.
. Congenital disorder of glycosylation due to DPM1 mutations presenting with dystroglycanopathy-type congenital muscular dystrophy. Mol Genet Metab 2013;110:345–51.
. DPM2-CDG: A muscular dystrophy–dystroglycanopathy syndrome with severe epilepsy. Ann Neurol 2012;72:550–8.
. Deficiency of Dol-P-Man synthase subunit DPM3 bridges the congenital disorders of glycosylation with the dystroglycanopathies. Am J Hum Genet 2009;85:76–86.
. Mutations in the O-mannosyltransferase gene POMT1 give rise to the severe neuronal migration disorder Walker-Warburg syndrome. Am J Hum Genet 2002;71:1033–43.
. POMT2 mutations cause α-dystroglycan hypoglycosylation and Walker-Warburg syndrome. J Med Genet 2005;42:907–12.
. Physical and functional association of human protein O-mannosyltransferases 1 and 2. J Biol Chem 2006;281:19339–45.
. Mutations in ISPD cause Walker-Warburg syndrome and defective glycosylation of α-dystroglycan. Nat Genet 2012;44:581–5.
. ISPD loss-of-function mutations disrupt dystroglycan O-mannosylation and cause Walker-Warburg syndrome. Nat Genet 2012;44:575–80.
. Muscular dystrophy and neuronal migration disorder caused by mutations in a glycosyltransferase, POMGnT1. Dev Cell 2001;1:717–24.
. Exome sequencing and functional validation in zebrafish identify GTDC2 mutations as a cause of Walker-Warburg Syndrome. Am J Hum Genet 2012;91:541–7.
. Mutations in B3GALNT2 cause congenital muscular dystrophy and hypoglycosylation of α-dystroglycan. Am J Hum Genet 2013;92:354–65.
. An ancient retrotransposal insertion causes Fukuyama-type congenital muscular dystrophy. Nature 1998;394:388–92.
. Mutations in the Fukutin-Related Protein Gene (FKRP) cause a form of congenital muscular dystrophy with secondary laminin α2 deficiency and abnormal glycosylation of α-dystroglycan. Am J Hum Genet 2001;69:1198–209.
. Absence of post-phosphoryl modification in dystroglycanopathy mouse models and wild-type tissues expressing non-laminin binding form of α-dystroglycan. J Biol Chem 2012;287:9560–7.
. Mutations in the human LARGE gene cause MDC1D, a novel form of congenital muscular dystrophy with severe mental retardation and abnormal glycosylation of α-dystroglycan. Hum Mol Genet 2003;12:2853–61.
. Like-acetylglucosaminyltransferase (LARGE)-dependent modification of dystroglycan at Thr-317/319 is required for laminin binding and arenavirus infection. Proc Natl Acad Sci USA 2011;108:17426–31.
. Missense mutations in β-1,3-N-acetylglucosaminyltransferase 1 (B3GNT1) cause Walker–Warburg syndrome. Hum Mol Genet 2013;22:1746–54.
. Deciphering the glycosylome of dystroglycanopathies using haploid screens for Lassa Virus entry. Science 2013;340:479–83.
. ZC4H2 mutations are associated with Arthrogryposis multiplex congenita and intellectual disability through impairment of central and peripheral synaptic plasticity. Am J Hum Genet 2013;92:681–95.
. HomozygosityMapper2012—bridging the gap between homozygosity mapping and deep sequencing. Nucleic Acids Res 2012;40:W516–20.
. Aligning sequence reads, clone sequences and assembly contigs with BWA-MEM. http://arxiv.org/pdf/1303.3997.pdf (accessed 12 Jan 2014).
. Fatal Cardiac Arrhythmia and Long-QT syndrome in a new form of congenital generalized lipodystrophy with muscle rippling (CGL4) due to PTRF-CAVIN mutations. PLoS Genet 2010;6:e1000874.
. Identification of a nonsense mutation in the carboxyl-terminal region of DNA-dependent protein kinase catalytic subunit in the scid mouse. Proc Natl Acad Sci 1996;93:10285–90.
. Characterization of two splice variants of human organic anion transporting polypeptide 3A1 isolated from human brain. Am J Physiol—Cell Physiol 2007;292:C795–806.
. ANAPC1 and SLCO3A1 are associated with nicotine dependence: Meta-analysis of genome-wide association studies. Drug Alcohol Depend 2012;124:325–32.
. Plectin 1f scaffolding at the sarcolemma of dystrophic (mdx) muscle fibers through multiple interactions with β-dystroglycan. J Cell Biol 2007;176:965–77.
. Congenital hydrocephalus in genetically engineered mice. Vet Pathol Online 2012;49:166–81.
. Plectin interacts with the rod domain of type III intermediate filament proteins desmin and vimentin. Eur J Cell Biol 2011;90:390–400.
. Sarcolemma instability during mechanical activity in Largemyd cardiac myocytes with loss of dystroglycan extracellular matrix receptor function. 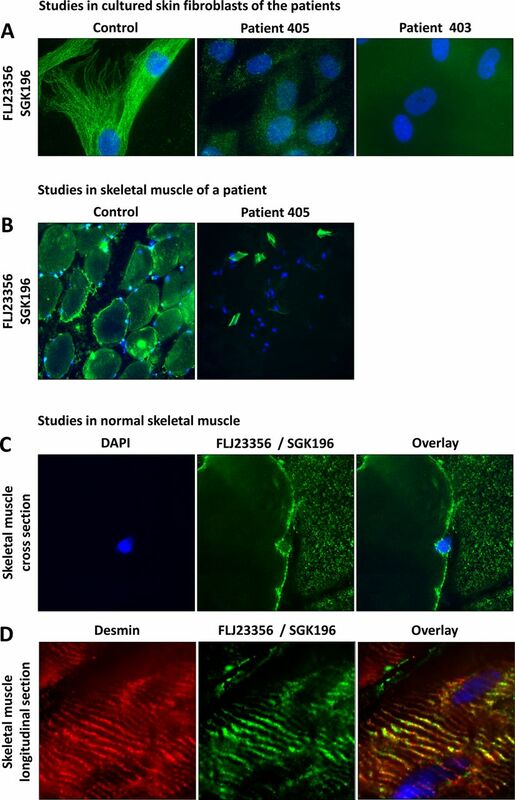 Hum Mol Genet 2011;20:3346–55.
. Knockdown of desmin in zebrafish larvae affects interfilament spacing and mechanical properties of skeletal muscle. J Gen Physiol 2013;141:335–45. Contributors JH, AvM, CH phenotyped the patients. MS performed the autozygosity mapping. AvR, MS validated the results of the whole exome sequencing. EG performed the Sanger sequencing. MVP, SL performed western blotting. MVP, SL, WS performed the immunostainings. MS supervised the work and obtained funding support. AvR and MS wrote the manuscript. All authors read the final version of the manuscript and gave their permission for publication. Funding The project was funded by a grant of the Einstein Foundation Berlin (A-2011-63) to MS and the Deutsche Forschungsgemeinschaft—NeuroCure Center of Excellence (Exc 257) to MS. MVP was supported by the German-French Graduate School MyoGrad (Deutsche Forschungsgemeinschaft). Ethics approval Ethical review board of the Charité University Medical Center, Berlin, Germany (ref# EA1/228/08).